Why are so many public urban schools deemed “failing”? What are the key issues in public urban education? How does the district paradigm address the specific urban issues? Without those answers, the handoff to “charter businesses” is academic gambling, financially fraudulent and morally vacant. Even with a myopic focus on test scores, there is still no charter operator clearly delivering higher scores, with the same student profiles, at a sustainable investment cost. I submit that the coveted scores cannot be dependably delivered, even with more money, new paint, some computers and more aggressive use of teaching-faculty labor. 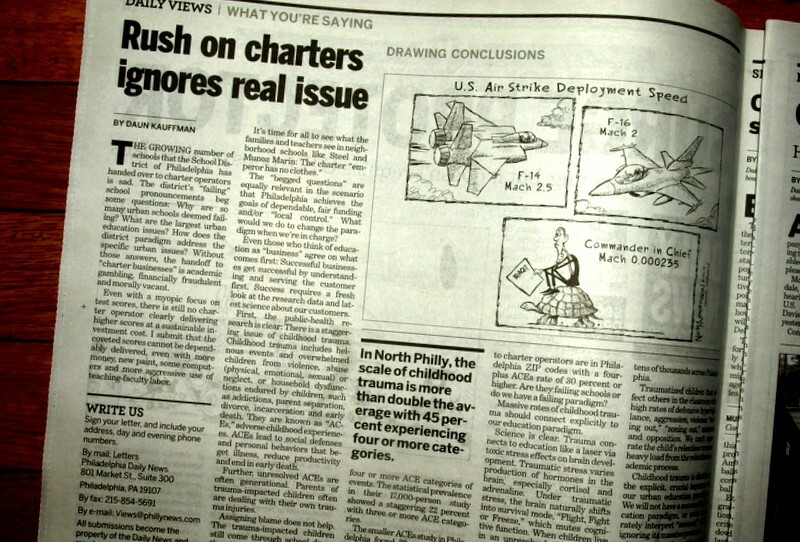 It’s time for all to see what the families and teachers see in neighborhood schools in Philadelphia, PA, such as Edward T. Steel and Luis Munoz Marin elementary schools: The charter “emperor has no clothes.” When they had a voice, families voted against charter business conversion at both schools. What would we do to change the paradigm when we’re in charge (with “local control”)? Even those who think of education as “business” should agree on what comes first: Successful businesses get successful by understanding and serving the customer first. Success requires a fresh look at the research data and latest science about our education “customers”. First, the public-health research is clear: There is a staggering prevalence of childhood trauma. Two of every three children are impacted at some level. Trauma-impacted kids are more common than seasonal allergy suffers. Developmental trauma includes heinous events and overwhelmed children from violence, abuse (physical, emotional, sexual) or neglect, or household dysfunctions endured by children, such as addictions, mental illness, or parent separation, divorce, or incarceration. They are known as “ACEs,” adverse childhood experiences. ACEs change physical brain architecture, lead to social defenses and personal behaviors that beget injury and illness, reduce productivity and end in early death. Yes, early death. The seminal research by Centers for Disease Control(CDC) and KaiserPermanente found the number of children with three, or more ACEs to be 22%. In other words, there are more ACE-impacted kids than English Language Learners (ELL) and more than those with Individual Education Plans (IEP). We accommodate and fund support for ELL and IEP students… And the CDC/Kaiser study was fielded in beautiful suburban San Diego, among middle class, mostly white, college educated, working folks with medical insurance! In North Philly, the scale of childhood trauma is more than double the rate found in San Diego. In some urban Philadelphia schools (page 17 map HERE) the number of ACE-impacted students is greater than ELLs and IEPs combined . The U.S. Department of Justice (in 2012 !) identified childhood trauma as a national epidemic. The Surgeon General described it as a health crisis of the highest priority (back in 1979). The deep, lifelong impacts of childhood trauma are more overwhelming than its wide prevalence. Kids do not “just get over it”. Three or more ACEs is significant because three+ ACEs correlate with doubled risk of depression, severe obesity, drug abuse, lung disease, and liver disease. It triples the risk of alcoholism, STDs and teen pregnancy. Remember, the CDC/Kaiser study was conducted in the suburbs. Assigning blame does not help. Unresolved ACEs are often generational. Parents of trauma-impacted children often are dealing with their own trauma injuries. Meanwhile, the trauma-impacted children will still be coming through school doors tomorrow morning – children who have a right of equal access to education. We don’t need blaming, we need training and strategies and resources to deliver equal access to all children. Back to the strategy of closing neighborhood schools: In our city, Philadelphia, most of the so called “failing” schools given away to charter operators sit in ZIP codes with ACE rates of 30 percent to 50 percent+ who are impacted by FOUR+ ACEs. School District administrators seem to get rid of their own accountability when they get the children and their schools “off the books” as charter school businesses. That is morally wrong. “Are they failing schools or do we have a failing paradigm? Philadelphia ACE prevalence by zip code map CLICK HERE (pg.17). It is difficult to absorb; stunning. Yet, It is the elephant in the room. Overwhelming rates of childhood trauma should connect explicitly to our education paradigm. Science is clear. Trauma connects to education like a laser via toxic stress effects on brain development. Traumatic stress varies production of hormones in the brain, especially cortisol and adrenaline. Under traumatic stress, the brain naturally shifts into survival mode, “Flight, Fight or Freeze,” which mutes cognitive function. When children live in an unresolved traumatic state of “survival,” there is a “new normal” with altered neurobiology. Developmental Trauma changes architecture of the physical brain. Development of cognitive functions is injured. These injuries relate to academic processes, especially crucial “executive function,” memory and literacy. The process also leads kids to distorted perceptions of social cues, which alter behaviors in response. The data says that these children are 30 to 50 percent of our district’s students – tens of thousands across our one city of Philadelphia. Traumatized children then affect others in the classroom with high rates of defensive hypervigilance, aggression, violence, “acting out,” “zoning out,” mistrust and opposition. We can’t separate the child’s relentless trauma-heavy load from the relentless academic process for all students. Developmental trauma is absent as the explicit, crucial keystone of our urban education paradigm. We will not have a successful education paradigm, or even accurately interpret “success,” while ignoring its massive presence. It would be like getting a new owner for the Phillies, all new uniforms, new equipment and a refurbished field, while ignoring the fact that eight to 12 players (30 to 50 percent) were each dealing with three or more injuries: shoulder, knee, rib and ankle injuries. District administrators must be held accountable. In their “education-factory” model, they focus on a plethora of secondary detail about the factory. They don’t talk about the children (or their families) or the neurological impacts of trauma. Children are not the center, in their model, in fact the children are often ignored. or check out the Mission to LucidWitness HERE, for many more links and citations. Edited version at Philly.com, HERE.